Venice, 13/05/2019 at 11 a.m. Recent neopopulist ideas have gripped democracies around the globe. They have brought with them new forms of tribalism, hatreds of outgrips (religious groups and migrants) anti-feminist and anti-women regressive policies. But to defeat these powerful forces requires a proper analysis of their attraction. First, we need to understand that neopopulism is a reaction to neoliberalism and the damage it has wrought. Neopopulism, while reactionary and nostalgic for an imagined past, also contains a *discourse of care *that explains its appeal. This discourse of care is paternalistic and rests on fear of imagined, threatening, others. Defeating neopopulism requires more than a critique of neoliberal economics, it also requires addressing specifically the racist/ xenophobic and masculinist appeals of neopopulism. A democratic care ethics provides a convincing way to address these concerns. 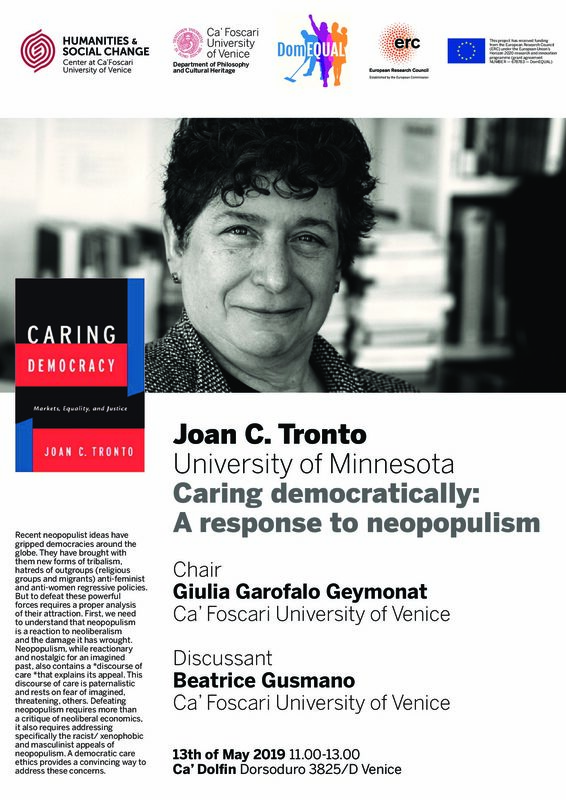 prof. Joan Tronto teaches at the University of Minnesota.